This is one of our favorite Chardonnays we have bottled to date, regardless of vintage and designation. The 2003 growing season produced conditions ideal for high quality Chardonnay fruit production. 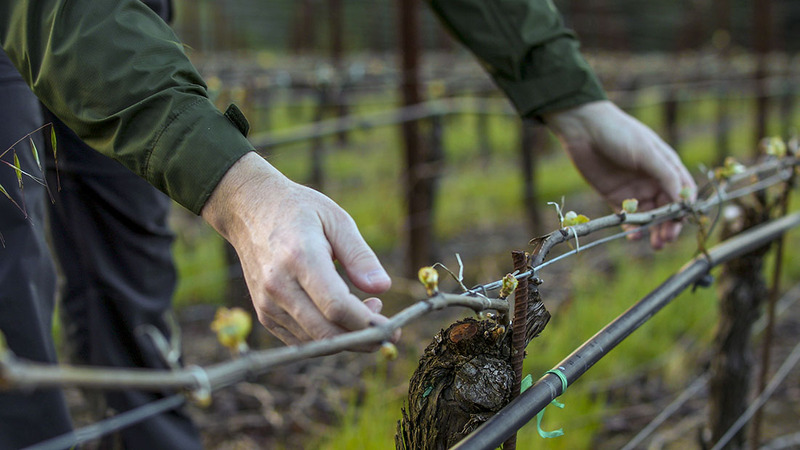 The unusually wet spring recharged the soils allowing our mostly old vine dry farmed vineyards to grow strong, healthy canopies which translated to intense flavors come harvest. Crop levels were moderate with small, loose clusters and many seedless, shot berries, which burst forth with intense limey acidity and extract. The wonderful Indian summer produced an extended five-week Chardonnay vintage, allowing us to harvest and vinify at a leisurely pace to fully exploit fruit of such natural concentration. Tasting the fruit on the vine one got a sense of the intensity and balance and this was immediately apparent in the young wines. Fermentations proceeded at a natural slow pace with some taking as much as six months, creating sleepless nights but ultimately increasing mid-palate texture. With wines of such richness and deft balance, lees stirring was kept to a minimum to maximize subtle vineyard expression and precise acid structure. The blend was assembled after 10 months on the fermentation lees and then returned to barrel on the fine lees for a further five months to allow the individual components to integrate and harmonize, prior to unfiltered bottling. Piercing aromas of flint, minerals and fresh citrus blend with richer notes of orange blossom, ripe fig and lemon custard, with a trace of white pepper. The palate is explosive in its citrus minerality with orange peel, spiced apple, honeysuckle and fresh mint. The mid palate is youthfully tight but textured cr?me brulee and hazelnut notes offer a glimpse of future richness. Vibrant acidity offers great cut to the lingering finish. Two years of aging will allow the wine's inherent richness to blossom although with such prominent acidity and purity of flavor, this promises to remain a balanced, vibrant Russian River Chardonnay to drink over the next five years. Serve at no cooler than 55 degrees to ensure full flavor development.